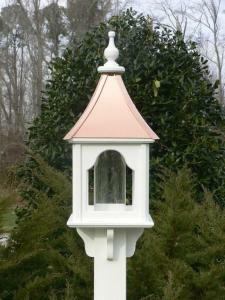 This square classic bird feeder will not crack,rot,split or fade. Bright Copper Roof adds to the unique classic look. No maintenance and no painting required. This feeder is maintenance free for many many years of enjoyment. Post available locally at most home improvement stores. MADE IN THE USA QUALITY PRODUCT NOTE:Allow 4 or 5 days out of the warehouse.